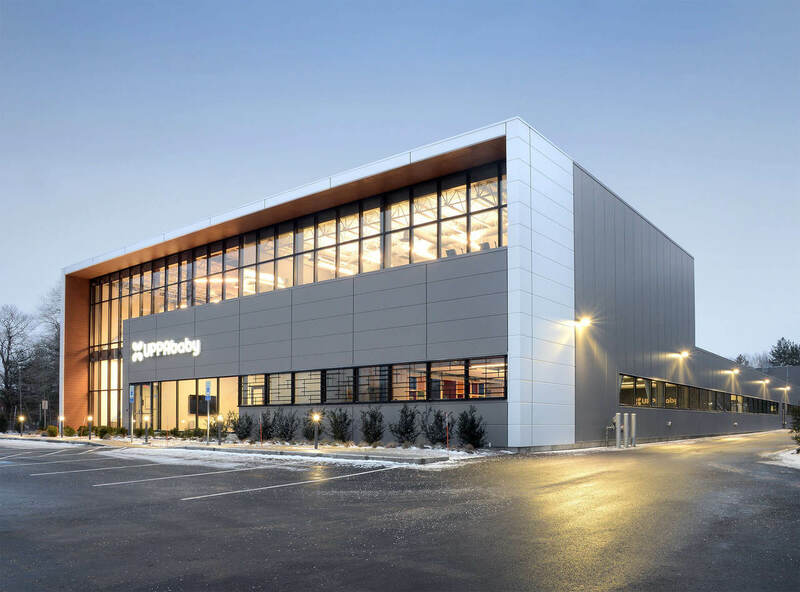 High-end stroller retailer UPPAbaby, based in Rockland, Mass., turned to a modern glass and Metl-Span-insulated metal panel façade for its new 45,000-square-foot headquarters. The mixed-use project accommodates a 15,000-square-foot warehouse and maintenance workshop, as well as a retail front to conduct direct-to-consumer business, while the majority of the facility will be dedicated to an open office concept. The campus design matches the company’s distinct approach to the growing baby product and accessory industry — delivering “higher standards of innovation and style,” according to the UPPAbaby website. The architectural team from Bergmeyer Associates, based in Boston, used smooth insulated metal panels (IMPs) with metallic coatings and a glass curtain wall to further the contemporary design choices. The unique blend of building envelope products “achieves our intended look of an industrial warehouse aesthetic, with a cool, funky vibe on the interior,” says Kubinski. 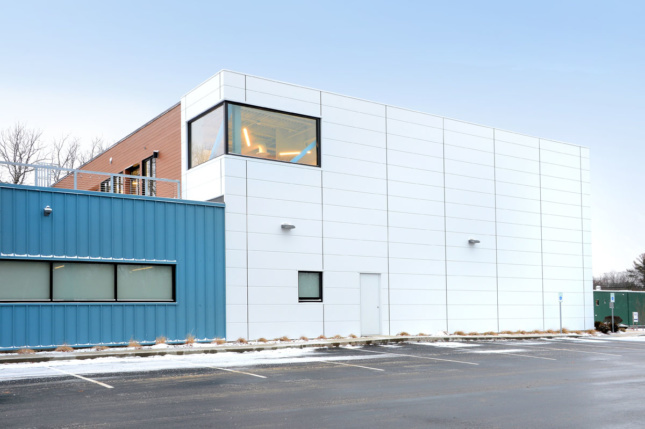 The project’s high-performance building envelope showcases nearly 4,000 square feet of 22/26 gauge CF Architectural Flat IMPs, including 2,907 square feet of panels in Polar White and 933 square feet of panels in Slate Gray. Specified in the profile’s three-inch thickness, the system offers an exceptional R-Value of 25. 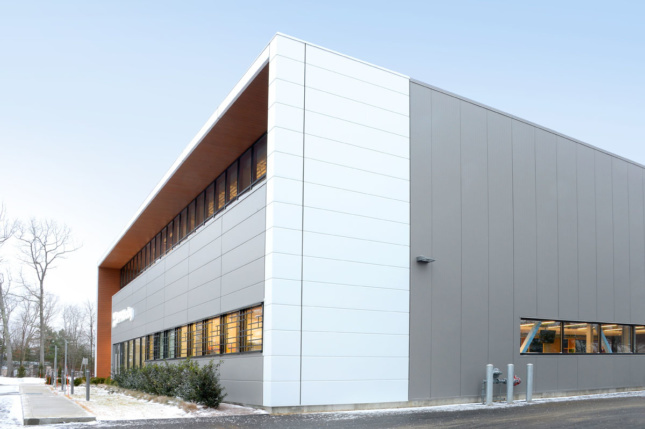 Kubinski implemented the horizontal CF Architectural Flat panels to create the “wow” factor at the building’s entrance. IMPs offer a mixture of design options, including mitered panel edges, superior flatness, and a vast array of profiles, textures and reveal configurations. CF Architectural flat wall profiles are ideally suited for designers seeking a monolithic architectural façade without sacrificing performance elements. With the highest insulating value per square inch of any metal wall insulation solution, IMPs can significantly decrease a building’s energy costs. And because the insulation is factory-applied, IMPs offer a consistency in insulation throughout the wall system to provide even thermal performance. IMPs offer several energy efficiency features to decrease the ecological footprint of the building. The panels provide high-performance thermal efficiency and moisture control, while a factory foamed-in-place insulating core minimizes insulation gaps. Sales Engineer Ed Montani, of installer Controlled Environment Structures, LLC, said that IMPs offer significant advantages when it comes to minimizing installation time and expense. 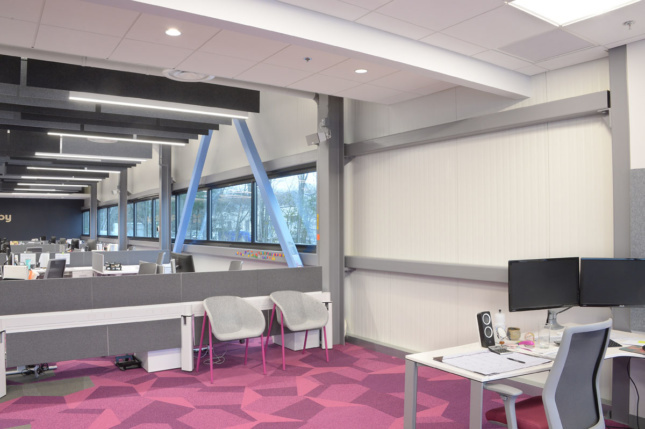 In particular, IMP systems “can easily be installed in cold weather,” which proved to be a difference-maker for the UPPAbaby Rockland campus’ fast-track construction schedule. Beyond the facade, the dedicated interior office space features modern art, exposed structural steel and architectural finishes including wood slats and ceiling décor. The design relies on the use of glass dividers, with no office doors or cubicles, and incorporates both a fitness complex and a second-floor exterior deck and barbecue center. 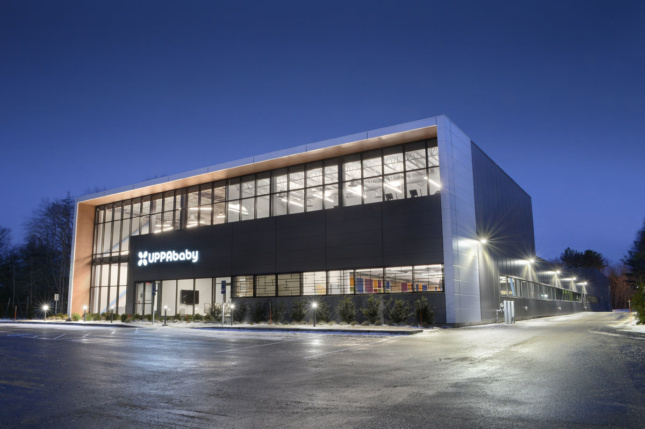 The UPPAbaby team moved in to its new headquarters in November 2017 after just one year of construction.